When your budgies lay eggs, those eggs won't always hatch, especially if they haven't been fertilized. Even if your budgies have mated, sometimes those eggs aren't viable or may not have been cared for properly by the birds. If your budgies, also known as parakeets, are laying whole clutches of eggs that don't ever hatch, you'll want to consult with your avian vet to determine why. Parakeets don't need to breed to produce eggs, although the eggs that they produce won't be fertilized and, thus, won't hatch. If your pair of budgies is incompatible, they won't mate, thus any eggs the female lays won't be viable. Some inexperienced birds younger than 1 year old may even mate unsuccessfully so that the female will produce clutches of unfertilized eggs. The male budgie could also be infertile and the female will then produce unfertilized eggs even after mating with him. If Polly lays clear eggs that don't show any signs of blood vessels when you hold them up to the light, those eggs aren't fertile and don't contain a viable embryo inside. A pair of budgies needs their own space to successfully produce a family. Keeping multiple pairs of birds in a small cage will ultimately lead to clashes between them. Other female budgies who aren't nesting with a mate may even injure the eggs that your breeding pair lays, jostling them or pecking at them, warns BirdChannel.com. To prevent your eggs from becoming damaged by other birds, killing the embryos inside, separate your breeding pairs into separate cages or breeding cabinets that are at least 30-by-18-by-18 inches in size. They'll also need a comfy nest box to lay their eggs in that is at least 6-by-6-by-10 inches. To lay fertile eggs that will hatch into budgie babies, both parakeet parents need to be healthy and well-nourished. Females need extra calcium to produce eggs with a strong shell in the form of a cuttlebone or mineral block. Without the proper nutrition, including fruits, veggies and nutritionally balanced seed and pellet mixes designed for budgies, your expectant mom won't have the energy to incubate her eggs once she lays them. A mother typically sits on her eggs after she lays them, keeping them warm for 18 to 21 days, according to AvianWeb.com. Without her warmth, the embryos won't develop and the eggs won't hatch. The skin of a male budgie's nose, called the cere, will be a bright blue color when he's ready to breed, while a female's will be dark brown in color and a bit crusty. Prime breeding times occur in the late summer and early autumn in temperatures between 65 and 75 degrees Fahrenheit with some humidity. If your budgies aren't ready to mate, conditions aren't ideal or they're kept in filthy cages, their eggs either won't be viable or the parents won't care for them correctly. Your birds may simply also be unhealthy and a trip to the avian vet is in order to see what could be wrong with them. 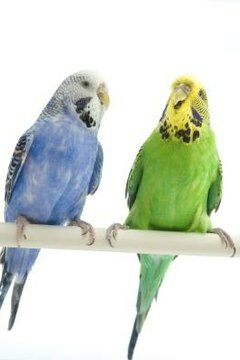 BirdChannel.com: Want to Breed Budgies/Parakeets?